Motorcycles lined up on Main Street during the Sturgis motorcycle rally. The Sturgis Motorcycle Rally is an American motorcycle rally held annually in Sturgis, South Dakota, for ten days usually during the first full week of August. In 2015 the city of Sturgis officially expanded the dates to have the rally start on the Friday before the first full week of August and end on the second Sunday. It was begun in 1938 by a group of Indian Motorcycle riders and was originally held for stunts and races. Attendance has historically been around 500,000 people, reaching a high of over 700,000 in 2015. The event generates around $800 million in revenue. The first rally was held by Indian Motorcycle riders on August 14, 1938, by the Jackpine Gypsies motorcycle club. The club still owns and operates the tracks, hillclimb, and field areas where the rally is centered. The first event was called the "Black Hills Classic" and consisted of a single race with nine participants and a small audience. The founder is Clarence "Pappy" Hoel. He purchased an Indian motorcycle franchise in Sturgis in 1936 and formed the Jackpine Gypsies that same year. 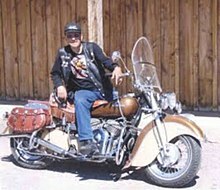 The Jackpine Gypsies were inducted to the Motorcycle Hall of Fame in 1997. Hoel was inducted into the AMA Hall of Fame the following year, in 1998. The Buffalo Chips Campground opened in '81. Its first concert for the Sturgis Rally was Jerry Lee Lewis in '82. In '87 it had Canned Heat. '89-Mitch Ryder, '90-Bachman-Turner Overdrive (from Winnipeg), Marshall Tucker Band, '90-Joe Walsh, 91-Kentucky Headhunters, 92-Stray Cats, 94-Blues Traveler, 97-The Guess Who (from Winnipeg), 98-Lynyrd Skynyrd, 99-Def Leppard (from UK),'00-Montgomery Gentry, Kenny Wayne Shepherd, Cheap Trick, Styx (from Chicago) with REO Speedwagon, Jonny Lang (from ND), and Cher, 01-Sheryl Crow, Grand Funk Railroad, 02-Smash Mouth, 03-Our Lady Peace, 3 Doors Down, Seether (from S. Africa), 04-Heart (from Seattle), Nickelback (from Alberta), '05-Shinedown, Tim McGraw, Steve Miller Band, 06-Keith Urban, Kid Rock, Tom Petty, 07-Buckcherry, Papa Roach, Velvet Revolver, Daughtry, 08-Staind, Puddle of Mudd, Theory of a Deadman, Saving Abel, 09-Hinder, Aerosmith, 10-Bob Dylan (from MN), Stone Sour (from Des Moines), Disturbed (from Chicago), Jason Aldean, 11-Pop Evil with Alice Cooper, 12-Zac Brown Band, Loverboy (from Calgary), 13-Sublime with Rome, 14-Florida Georgia Line, The Pretty Reckless, Train, Motley Crue, 15-Five Finger Death Punch, 16-Miranda Lambert, Willie Nelson, Weird Al Yankovic, '17-Alter Bridge, Trapt, Blink-182, Ozzy Osbourne. In 2018, Buffalo Chips hosted Yelawolf, Chevelle, and Eric Church for the Rally. The South Dakota Department of Transportation provides official traffic counts, which sometimes differ from official attendance figures. Attendance is higher on major anniversaries (e.g. 75th in 2015) and one or two years prior to the anniversary, and falls off the following year or two. For many years the city has been in a licensing agreement with a community non-profit, Sturgis Motorcycle Rally, Inc., and its predecessor-in-interest, the Sturgis Area Chamber of Commerce, that generates millions of dollars in royalties and sponsorship dollars. In 2012 the City Council reaffirmed this relationship through a unanimous proclamation. The City of Sturgis has calculated that the Rally brings over $800 million to South Dakota annually. The City of Sturgis earned almost $270,000 in 2011 from selling event guides and sponsorships. The rally makes up 95% of the city's annual revenue. There were 405 individuals jailed at the 2004 rally, and approximately $250,000 worth of motorcycles stolen annually. Rally-goers are a mix of white-collar and blue-collar workers and are generally welcomed as an important source of income for Sturgis and surrounding areas. The rally turns local roads into "parking lots", and draws local law enforcement away from routine patrols. Furthermore, the large numbers of people visiting the town and region served as a model for the state of Oregon in preparation for the solar eclipse of August 21, 2017, given the expected impact on emergency services. The Lakota Indian tribe in coalition with other tribes has protested the large amount of alcohol distributed at the event so close to the sacred Bear Butte, but also acknowledged that income from the event was important to the region and also benefits some members of the tribes. There has been a number of mysterious, unsolved deaths at the Rally. Many attendees of the Sturgis Rally have families, bring their children and drive campers towing motorcycle trailers to the rally, and ride their motorcycles just the last few miles. The director of the rally estimated in 2005 that less than half the attendees actually rode there. Shipping companies transport thousands of motorcycles to Sturgis for attendees who arrive via airline. The Black Hills Run is a route favored by motorcycle riders, across the Black Hills from Deadwood to Custer State Park, South Dakota. It reached the height of its popularity between 1939 and 1941. The popularity of the Sturgis Motorcycle Rally attracted additional attention to the route in recent years. The pine forested mountains of the Black Hills make for a unique scenic motorcycle ride. The Rapid City Journal features daily coverage of the Sturgis Rally. The Seattle Times covered some of the 2008 Sturgis Rally while rock band Judd Hoos was playing at the Loud American Roadhouse. In 1997, the crew from the COPS television series attended the rally, as well as Dennis Rodman. From 1996 to 1999, World Championship Wrestling held a pay-per-view event called Road Wild (Hog Wild for the 1996 event). Starting in 2009 an American reality television series began airing on the truTV network: Full Throttle Saloon, showing the inner operations at the world's largest biker bar just prior to the rally opening and for the duration of the rally each year. Sturgis was also featured on American Pickers Season 4, Episode 6, "What Happens In Sturgis...". Originally aired January 2, 2012 on the History Channel. ". . .When Mike tells Frank let's pack up for a trip to South Dakota, Frank says he can't. He's secretly going to his 30th annual trip to the legendary Sturgis motorcycle rally, but says he'll cover the shop. . .". Sturgis has also been featured in the TV Show Pawn Stars in which Richard Harrison, Corey Harrison visit Sturgis with Chumlee Russell on his birthday. ^ KOTA. "Can you handle 10 official days of the Sturgis Rally?". Retrieved January 14, 2017. ^ Sturgis area businesses make 95% of their annual revenue from the 7 days of the rally. ^ a b Higgins, Michelle (August 5, 2005). "The Really Easy Rider". The New York Times. Retrieved February 12, 2009. ^ "2007 Wrestling Almanac & Book of Facts". Wrestling's Historical Cards. Kappa Publishing. 2007. p. 144. 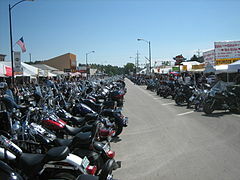 Wikimedia Commons has media related to Sturgis Motorcycle Rally. This page was last edited on 17 March 2019, at 13:24 (UTC).